Here is yet another beer that I have had on several occasions, but never took the time to review. My first experience with Dogfish Head’s Chicory Stout was two years ago, when I had it on draught at Champps in Marlton, NJ. I remember enjoying this beer immensely, but since it’s only available during the winter months, I’ve never had the chance to try it out of a bottle. Appearance: Deep, mahogany color. Thin half inch head that dissipates rapidly. Negligible amounts of lacing. Aroma: Semi-sweet dark chocolate. Medium roast coffee. Faint smell of licorice. Taste: Lightly carbonated. Creamy mouthfeel. Not as rich tasting as it smells. Very little bitterness. Lightly roasted coffee flavor from beginning to end. Mild licorice aftertaste. 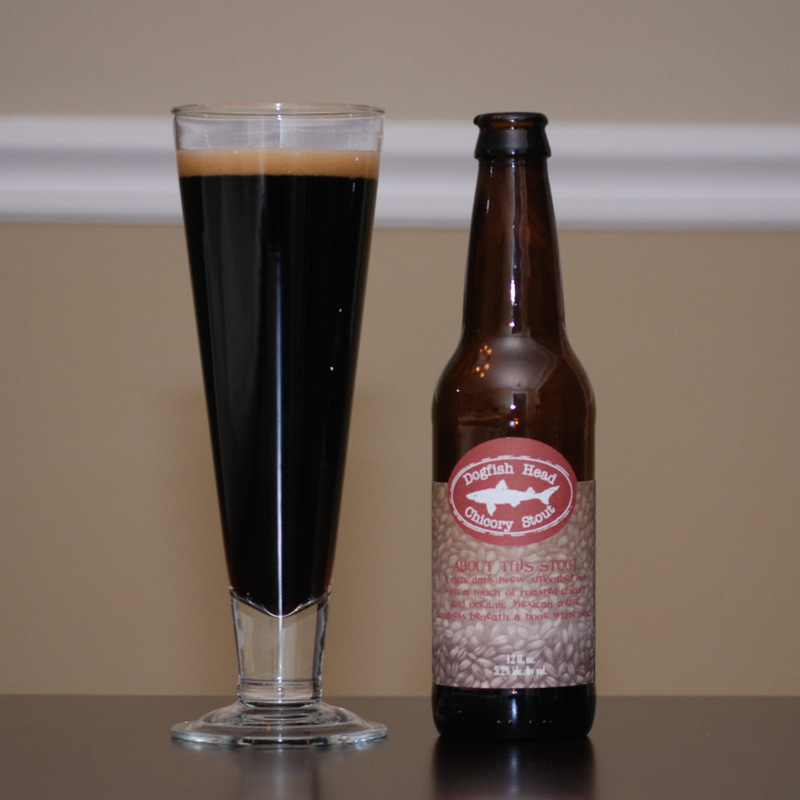 Dogfish Head’s Chicory Stout is a much lighter beer than I remember. The draught version was richer, creamier, and more flavorful than the bottled version that I am having right now. I’m on the fence about the bottled version. At just 5.2% ABV, having two or three of these in a row wouldn’t be a problem. But is there enough going on with this beer to warrant drinking more than just one? While I am enjoying the overall flavors (the subtle licorice aftertaste is particularly appealing), I can’t say that I’m loving it. If I happen to see it on draught at a bar, I will definitely order one, but as far as the bottled version goes, I think I’ll move on to something else.